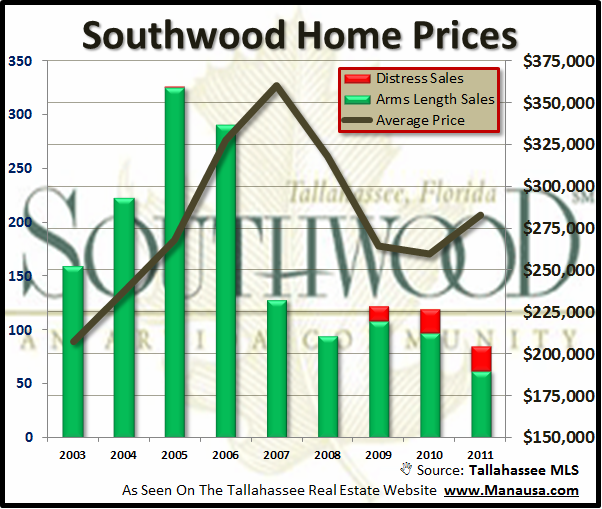 It's time for another look at Southwood home sales (the busiest neighborhood in Tallahassee). Currently, there are 46 homes for sale in Southwood in the Tallahassee MLS, and we are going to review the current status of this popular subdivision. The real estate graph below makes it appear as if home prices are on the rise in Southwood. 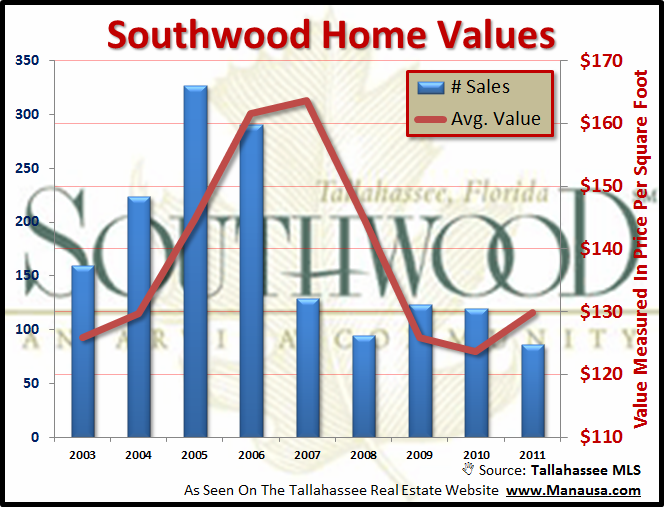 While it is a fact that the average home sales price in Southwood is higher this year, it does not mean that values are rising (more on this below). The average sales price of a home sold in Southwood this year has been just under $283K, up 9% from $259K in 2010. 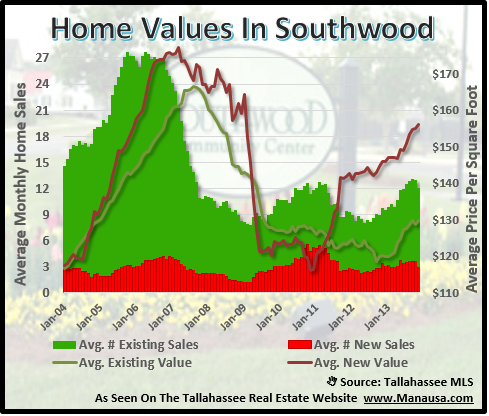 Home values appear to be on the rise in Southwood, if we look at the real estate graph below that plots the overall averages. The average price per square foot of a home sold in Southwood this year has been $130, which is 5% higher than the $124 recorded in 2010. 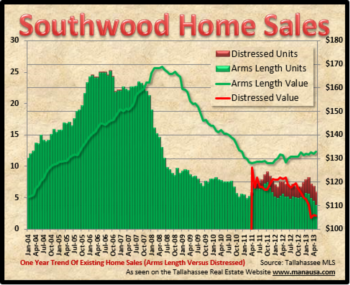 But with closer scrutiny, as we will see in the third and final graph, we will see what is happening with Southwood home sales. When we break Southwood home sales down to new versus existing home sales, the truth is easy to see. The average cost to build a new home in Southwood has risen greatly this year, making the overall "average" appear higher. But looking at the real estate graph below, we see existing home sales values (blue line) are still on the decline. There are still hundreds of homes in Southwood that need to be sold, both in the Tallahassee MLS as well as the Shadow Inventory of Homes. Pricing pressures will not be going away in 2012, and we will see our sixth straight year of falling home values.